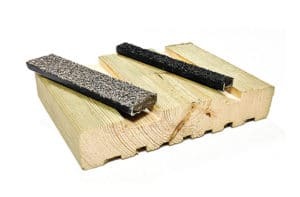 StadiaStrip is a heavy duty anti-slip, insert designed to add a robust anti-slip surface to timber or concrete. Available in two standard widths; 12mm or 23mm, standard length 1.2 metres. StadiaStrip requires a channel to be formed during the installation process. 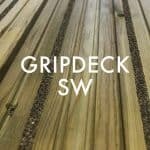 StadiaStrip decking inserts are manufactured in the UK to the very highest standards, guaranteed to deliver many years of use, even in areas with heavy foot traffic. As with all our products, the StadiaStrip has excellent ‘slip resistance’ – or anti-slip properties – having been tested to BS 79762: 2002 as advised by the UK Slip Resistance Group. When tested, StadiaStrip with a bauxite aggregate finish delivered an average value of 76 in the wet. In general, values of over 65 indicate a “Extremely Low” Potential for Slip Category. Enjoy complete peace of mind that your decking areas are safe for you, your workforce and for members of the public, with StadiaStrip heavy duty non-slip treads. * All Prices do not include VAT or Delivery.